Review posted October 26, 2014. Quirk Books, Philadelphia, 2014. 172 pages. ‘Tis here! The sequel to Verily, a New Hope. 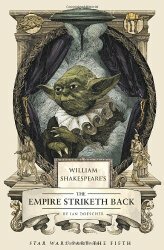 Here we have the second volume, Part the Fifth, in the Star Wars saga, as Shakespeare himself would surely have written it. This one includes Yoda, who already sounded Shakespearean, now speaking in haiku. Nay, nay! Try thou not. So beautiful as I depart from thee. From laughing at thy pride most heartily. But I am sewn of stronger thread than this. To say I would not let thee go – pish, pish! Enter UGNAUGHTS 1, 2, and 3, singing. UGN. 3 The time is ripe! UGN. 1 His time is nigh! UGN. 2 And soon he will be frozen! UGN. 3 But someone’s now been chosen! UGN. 2 A merry prank! UGN. 3 O shall it work? UGN. 1 Or will the man be dying? UGN. 2 The pleasure’s in the trying! That Ian Doescher has put a lot of thought into making these authentic is expressed in his Afterword. He explains his choice of haiku for Yoda, as well as other choices like having Boba Fett speak in prose rather than iambic pentameter. These books are far too much fun. I’d be willing to bet that no one’s ever read one of the volumes all the way through without bursting out and reading sections aloud.